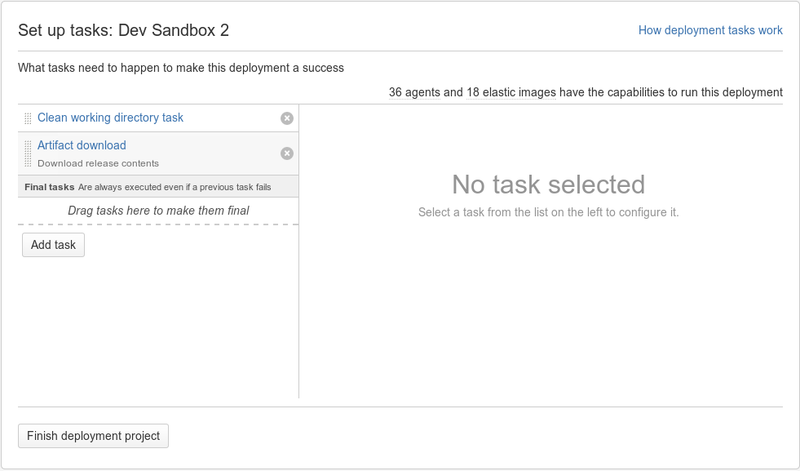 Build plans to deployment environments. You can specify which artifacts to keep by setting up an artifact definition for the job. The artifacts will be available after each build of the job. Navigate to the job, as described on Configuring jobs. Specify a Name for the artifact. Use Location to specify the folder, relative to the build directory, where the artifact will be located. Do not use the absolute path to the artifact. Wild cards are not supported. Copy pattern is relative to Location. For example, if you want to keep the latest version of a .jar file, you could specify Copy pattern to be ' */.jar' and the Location to be 'target'. Select the Shared check box if you want to share artifacts with other jobs in the plan. Artifacts are copied to a subdirectory (/JOB_KEY/download-data/) under your 'Build Directory' folder – see Locating important directories and files. You can share artifacts between jobs in different stages using artifact dependencies. For example, you may want to run acceptance tests on a build, sharing the same WAR from one job to another without rebuilding it each time. Each time the artifact is shared with a subsequent job, it is copied to the job's agent. 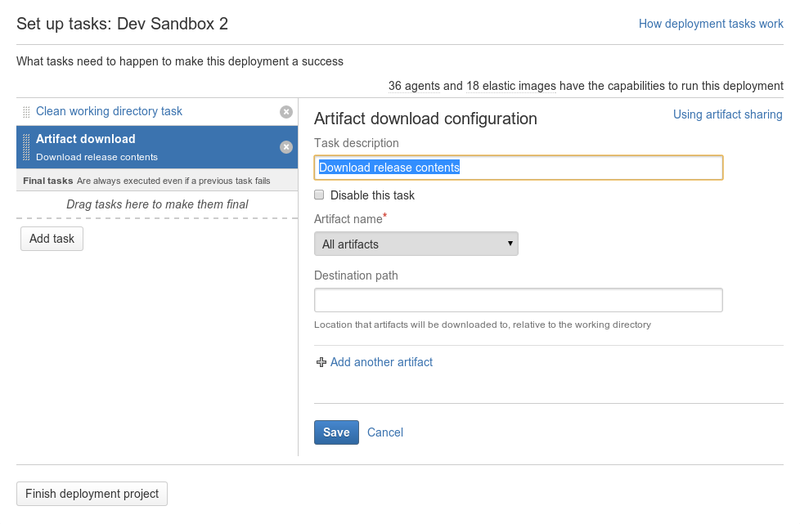 Navigate to the configuration pages for the job that will produce the artifact, as described on Configuring jobs, and click the Artifacts tab (see Configuring a job's build artifacts). Either click Share for an existing artifact, or create a new artifact definition, as described above. Navigate to the job in a subsequent stage that will consume the artifact, and click the Artifacts tab. Choose from the Artifact list. Specify the Destination directory, then click Create. The Artifact list only shows artifacts from jobs in previous stages that have been marked as shared. This is described in Configuring a job's build artifacts. Destination directory is relative to the build directory. Do not use the absolute path to refer to the destination directory. The artifact from the most recent successful build will be used. If there are no successful builds from the artifact-producing plan or the artifacts have expired, the artifact-consuming job will fail. You can share artifacts between different build plans, however you need to use the 'Artifact downloader task' to do so. For example, you may want to run acceptance tests on a particular build from a different plan by sharing the same WAR from one plan to another without rebuilding it each time. Locate the build plan that you wish to associate an artifact with. Select Configure plan from the 'Actions' drop down menu. Click on Stages & jobs and select a job or create a new job if one does not already exist. Click on the Tasks tab for the selected job. Click on Save to save your artifact download configuration. The Artifact drop down menu only shows artifacts from jobs in previous stages that have been marked as shared. This is described in Configuring a job's build artifacts. 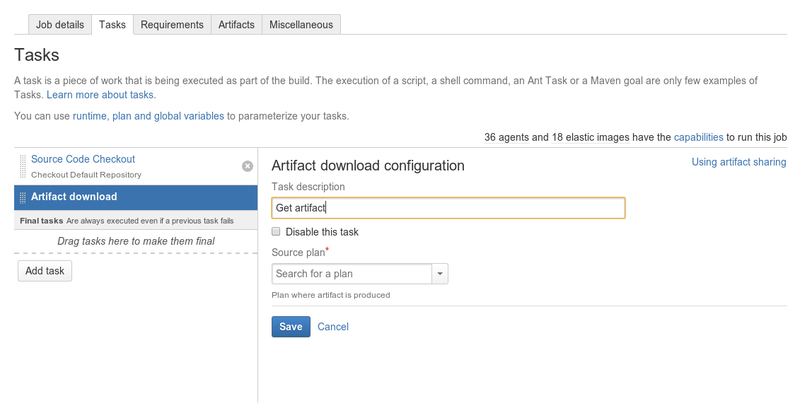 You can also share artifacts from a build plan into a deployment environment. For example, you may wish to share a particular build result from a plan with a deployment environment. To do this, you need to add the 'Artifact downloader task' to a deployment environment during or after the environment creation process. Task description A brief description of the artifact downloader task. Artifact Name Use the drop down menu to locate the name of the artifact that you want to download. Destination Path The location of the working directory into which you want the artifact downloaded. Click Add another artifact to add another artifact to the download list. Click Save to save your artifact download configuration.